Thank you Carapelli Olive Oil for sponsoring this post. For more information and a store locator, please visit CarapelliUSA.com and be sure to check out Carapelli’s social channels: Facebook and Instagram. 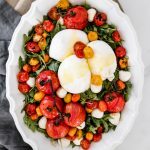 This Roasted Tomato Burrata Caprese Salad looks fancy but it is actually incredibly easy to create & tastes delicious as an entree or side dish! As I was wondering what type of salad pairs well with cooler weather, I fondly remembered the Roasted Tomato Lemon Pesto Pasta I made a few months back & decided that my ideal salad for cooler months is one loaded with roasted tomatoes, fresh mozzarella, burrata, & topped with balsamic & extra virgin olive oil. But not just any olive oil will do for this flavorful salad. 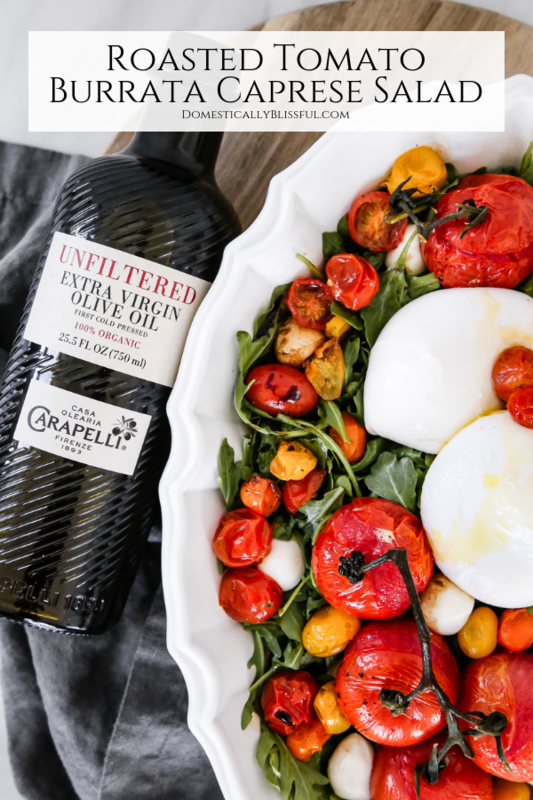 I used Carapelli Unfiltered Organic Extra Virgin Olive Oil which offers exquisite flavor with high-quality olives nurtured by nature, selected at the optimal harvest time & handled in the most delicate way. 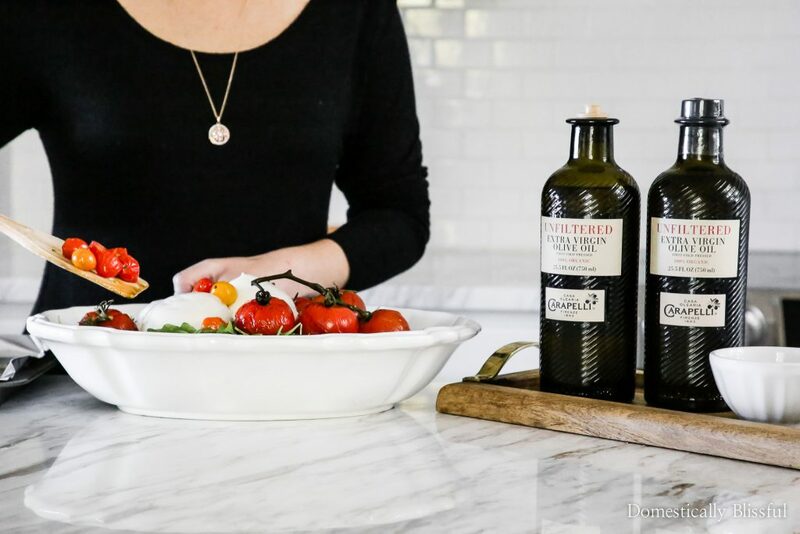 Carapelli’s beautifully & purposely crafted olive oil can elevate any dish. 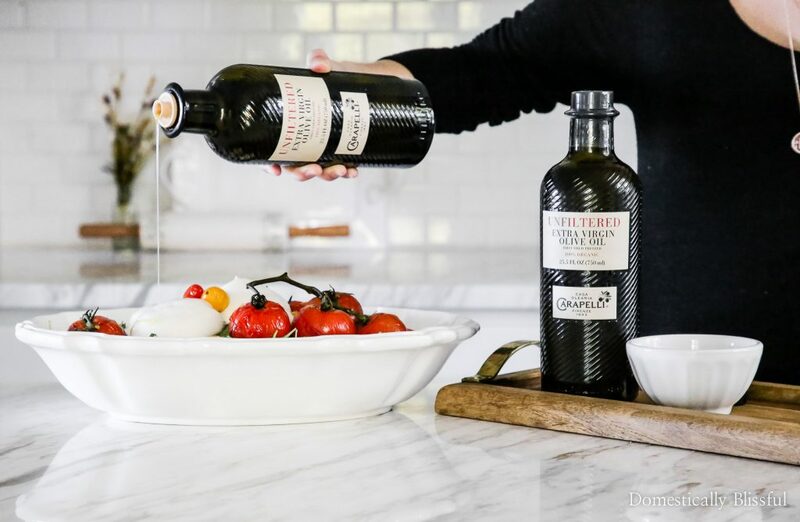 A few weeks ago, at a family dinner, we enjoyed Carapelli Extra Virgin Olive Oil with a splash of balsamic, salt, & pepper to dip our homemade bread. And in all honesty I wasn’t delicately dabbing my bread, I was letting it soak up as much of the Carapelli Extra Virgin Olive Oil as possible. What can I say, I LOVE high quality extra virgin olive oil! 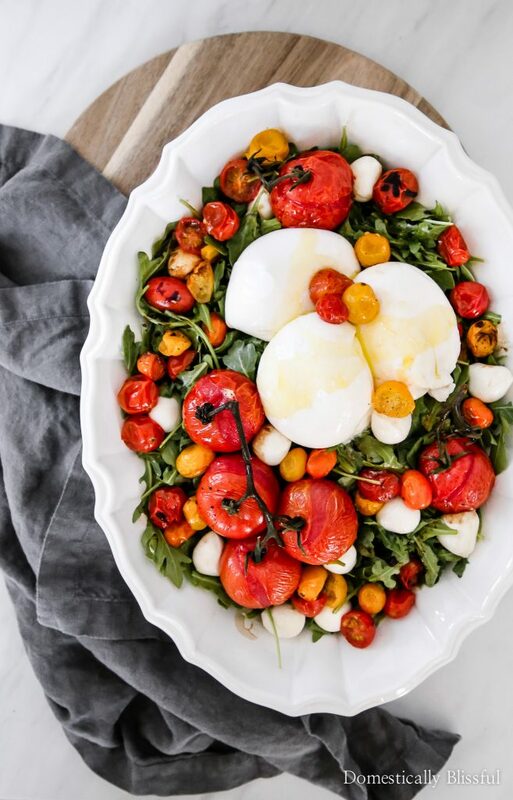 The beauty of this Roasted Tomato Burrata Caprese Salad is that it looks gorgeous, yet is incredibly simple to create. Basically, you roast tomatoes in Carapelli Unfiltered Organic Extra Virgin Olive Oil with a sprinkle of salt, pepper, & sugar. Then you top your bed of arugula with the roasted tomatoes, fresh mozzarella, burrata, basil, & drizzle with balsamic vinegar & Carapelli Extra Virgin Olive Oil. Crazy simple, right? But from the roasted tomatoes to the fresh cheese, to the extra virgin olive oil, the flavor is incredible! Carapelli Unfiltered Organic Extra Virgin Olive Oil is beautifully dense & nutty. It captures the nuances of nature in a remarkably flavorful cold-extracted oil which incorporates light pulp from the olives, giving the oil its naturally cloudy & rustic appearance. I highly recommend having some soft-centered, crusty bread on hand so that once the salad has been enjoyably devoured by you & your guests, you can soak up the rest of the yummy goodness that’s settled at the bottom of the bowl! 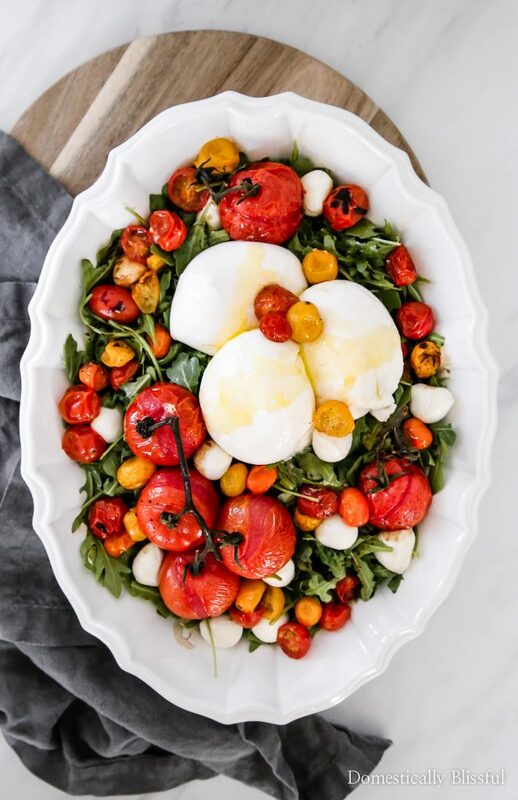 This Roasted Tomato Burrata Caprese Salad looks fancy but is actually incredibly easy to create & tastes delicious as an entree or side dish! First, preheat your oven to 425 degrees Fahrenheit & line a rimmed baking sheet with foil sprayed with oil. Drizzle the cherry tomatoes with 1 tablespoon Carapelli Unfiltered Organic Extra Virgin Olive Oil. Then sprinkle with 1 dash of salt, 1 dash of pepper, & 1/8 teaspoon sugar. Mix to combine. Place your 6 cocktail tomatoes on the baking sheet next to the sliced cherry tomatoes *(2) & bake for 15-18 minutes or until the cherry tomatoes are bubbly. Set to the side. Prepare your salad by placing the arugula in a large bowl & top with burrata, mini mozzarella, cooled tomatoes, & basil. Drizzle 1/4 cup Carapelli Unfiltered Organic Extra Virgin Olive Oil & 2 tablespoons balsamic vinegar on top. I like to roast a mixture of whole & halved cherry tomatoes. I set them on top of the Carapelli Unfiltered Organic Extra Virgin Olive Oil so that they don’t stick to the pan. 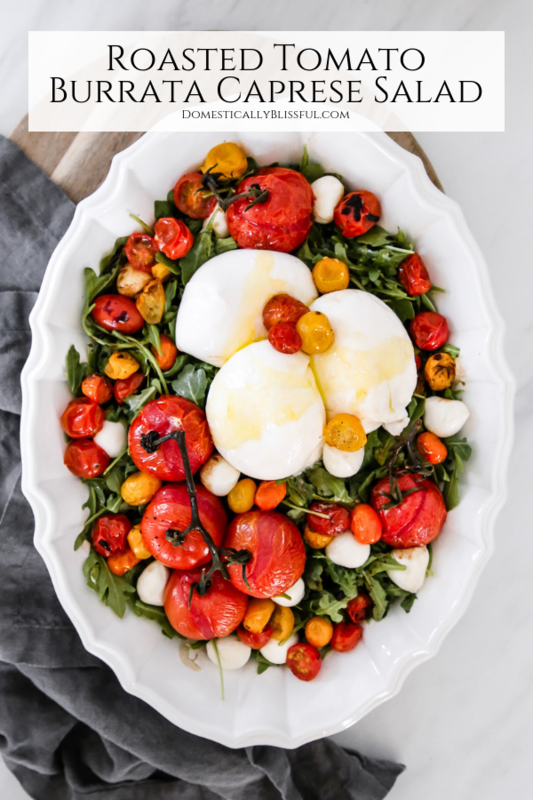 My tastebuds are craving this Roasted Tomato Burrata Caprese Salad all over again! 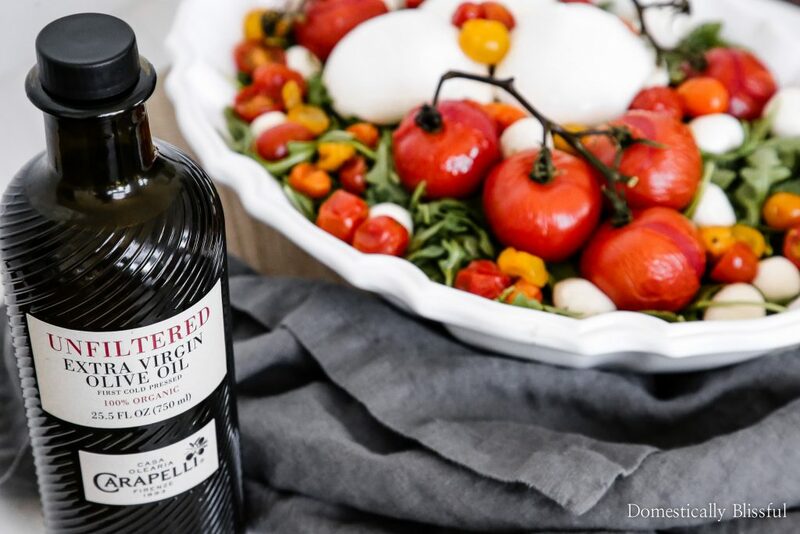 I hope you enjoy your Roasted Tomato Burrata Caprese Salad as much as I do & if you would like more information & a store locator, please visit CarapelliUSA.com & be sure to check out Carapelli’s social channels: Facebook and Instagram. 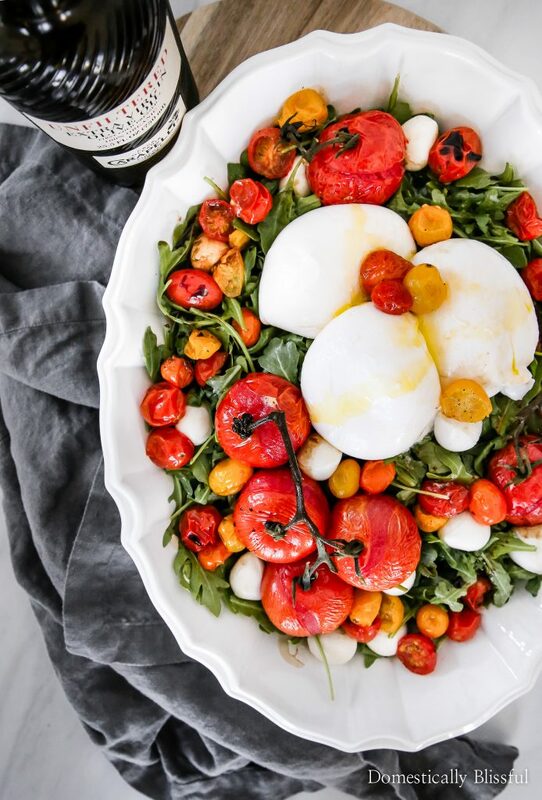 If you make this Roasted Tomato Burrata Caprese Salad this season be sure to share a picture & tag @DomesticallyBlissful on Instagram so that we can all see your delicious meal! And if you enjoyed this recipe, be sure to subscribe to my newsletter below so that you don’t miss out on another blissful bite! What is your favorite thing about this Roasted Tomato Burrata Caprese Salad?